Nine strap-on rocket motors are used to increase the main engine thrust. They use a solid rocket fuel called hydroxyl-terminated polybutadiene (HTPB) propellant. HTPB is a hard rubbery material that binds together the fuel and oxidizer. The rocket motors are made of a graphite-epoxy shell that is about 4 to 5 times lighter than metals. These shells provide the outer structure for the solid rocket motor fuel. 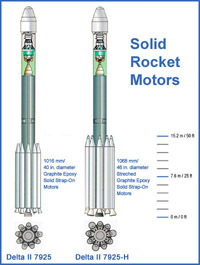 The rocket motors are familiarly known as graphite-epoxy motors, or "GEMs." Six of the nine GEMs are ignited at the time of lift-off. The remaining three, with extended nozzles, are ignited shortly after the initial six GEMs burn out and when the spacecraft is lighter due to the burning of fuel from Stage I. For the Rover A mission, which used the standard Delta II 7925 launch vehicle, the GEMs are 1016 mm (40 in) in diameter and are fueled with approximately 12,000 kg (26,400 lbs) of hydroxyl-terminated polybutad Each GEM provides an average thrust of 498,000 N (112,000 lbs). For the Rover B mission, which used the Delta II 7925H, the GEMs are 1168 mm (46 in) in diameter. The GEMs for the Delta II 7925H are also longer than the GEMs used on the Delta II 7925. The Delta II 7925H GEMs provide approximately 25 percent more thrust than the standard Delta II GEMs. See also the reasons for the differences.